The paired position of the eyes is a very discernible physical feature. Using a horizontal line drawn between the pupil of each eye, they should lie along the same position on this line as it crosses between the eyes. One structural condition that affects such eye symmetry is that of vertical orbital dystopia. Most commonly occurring due to a developmental issue, the eye and the bony orbital box that contains it is situated lower. Usually in the range 1 to 5 mms lower it creates a visible facial symmetry. In treating vertical orbital dystopia it needs to be recognized that a more complete solution is not just augmenting the orbital floor only to push up the eye. Rather all surrounding hard and soft tissues need to be considered. Superiorly is the position of the eyebrow and superior orbital rim lower than the other side? Does the upper eyelid have extra skin or does it have ptosis…if it is hanging lower? Besides the orbital floor and infraorbital rim is the cheek bone smaller/lower as well? Does the corner of the eyelid need to be raised up as the eye is moved higher? Besides the physical examination a 3D CT facial scan is needed to accurately determine the exact skeletal involvement. But it is important to not overlook the overlying soft tissues. As in all cases of orbital dystopia, all the surrounding structures may be involved if it has a developmental origin. In mild cases of vertical orbital dystopia (2 to 3mms), a common surgical approach would be orbital floor-rim augmentation and an upper blepharoplasty. 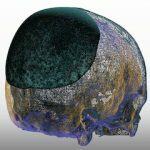 While a custom implant is always the ideal approach for building up the orbital floor and rim, hand made ePTFE implants can be effective in smaller defects. 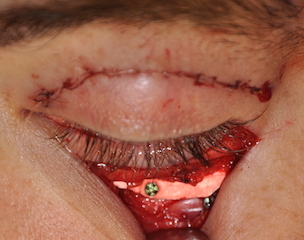 They are brought up over the rim and secured with microscrews through a lower eyelid incision. This can be combined with removal of extra eyelid skin which can raise the lash line up by a millimeter. A muellerectomy can also be done for a millimeter or two of actual ptosis repair. 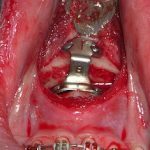 More moderate cases of congenital vertical orbital dystopia can be successfully treated with a combination of select bony augmentation and soft tissue excisional/repositioning procedures.